Want to improve your long-term memory? Then take advantage of this amazing fact: Your brain processes verbal and non-verbal input separately. Whenever you are reading or listening to something you want to remember (i.e., verbal information), activate your visual memory at the same time. THE BENEFIT: Using both verbal and non-verbal memory gives your brain two pathways of recall. Written and spoken language is "verbal" information. All other information, including visual images, is considered "non-verbal". The science behind this dual processing is explained by a theory proposed in 1971 by researcher Allan Paivio of the University of Ontario. 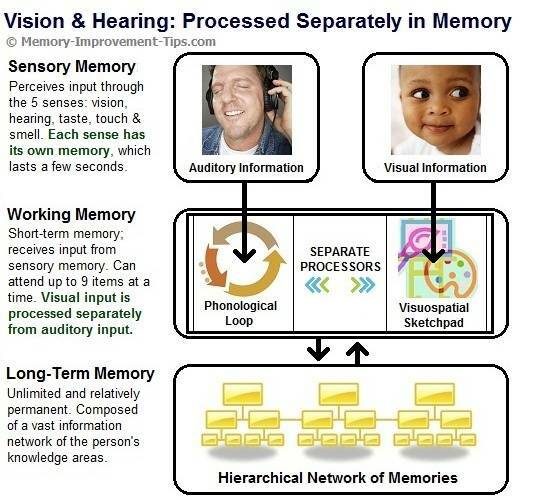 Paivio called this process the Dual Coding Theory of memory. As you can see, input that enters Sensory Memory is routed through separate locations in the brain depending on whether it is verbal or non-verbal information. Even within Working Memory (the next step after Sensory Memory), the verbal/non-verbal information is processed separately. Verbal input is attended to and processed in your brain's "phonological loop". Visual input is attended to and processed on your brain's "visuospatial sketchpad". From these two different locations, the information is encoded (transferred) to long-term memory. The point: Increase your chances of remembering information by learning it through multiple pathways. Throughout this site I advocate the use of visualization-based memory systems for all sorts of memory tasks. The reason is simple. For many people, these systems - such as the Peg Method, Loci or Roman Room, and Phonetic Number systems - work extremely well to enhance recall. Until I started using these visualization techniques several years ago, I thought my memory was actually defective. Today I understand that my brain prefers a visual learning style. While I can retain verbal and written information, my brain apparently finds it easier to store images. And that is fine and normal. Whether you are a visual learner or verbal learner, it still makes sense to take information in through both pathways. Where many people stumble is how to re-define audible or written information in a visual way that can be processed through the non-verbal pathway. Enter the Memory Systems. Converting spoken or written information to visual images is exactly what they are used for. Direct Visualization. Some verbal information can be visualized directly. For example, concrete nouns that represent physical objects, such as "train", "computer", "ball", and "pencil", can be easily pictured in your mind. Substitute Objects. Another way to convert verbal input to visual input is to imagine a representative object. For example, the term "exercise" is not concrete. But you can still visualize it by imagining yourself doing push-ups, or by deciding on a concrete noun like "dumbbell" or "bicycle" that will represent exercise to you. Substitute Words. There are many words and concepts that can't easily be visualized directly or with substitute objects. 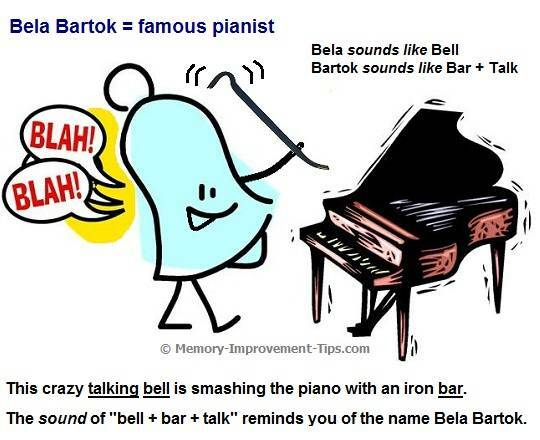 Suppose you want to remember the name of the famous Hungarian pianist Bela Bartok. How can you convert his name to a visual image? Fortunately (I'd say miraculously), the Substitute Word method provides a solution (see the Memory Association page for more info). The basic trick to using the Substitute Word method is to convert the phonetic sound of his name to an image in a memorable way. Here's how to go about it. First, determine what his name sounds like. To me, Bela sounds like the physical object "bell". The syllables of his last name Bartok sound like "bar" plus "talk". Easy so far, right? After rehearsing this image a few times, recalling it and its meaning along my visual pathway becomes automatic. All I have to do is think of the piano. The image of the "talking bell smashing the piano with an iron bar" literally pops into my mind. That's the visual pathway of memory in action. Notice, it isn't necessary to perfectly convert every syllable of his name. Just get close; your natural memory will do the rest. For instance, "bell" is close enough to "Bela" to act as a powerful hook for you to retrieve his true first name from memory. Your eventual goal should be to become expert enough with this type of visualization (through practice) to be able to easily create mental images on the fly. In other words, as you read any story, newspaper article, or book, you should be able to rapidly create a memorable mental image for each fact you want to remember. As you reach the end of each paragraph or section, review your images, then review them again later to set them more firmly in memory. All of the memory systems take advantage of your brain's verbal/non-verbal dual-coding functionality. Give the systems a try!